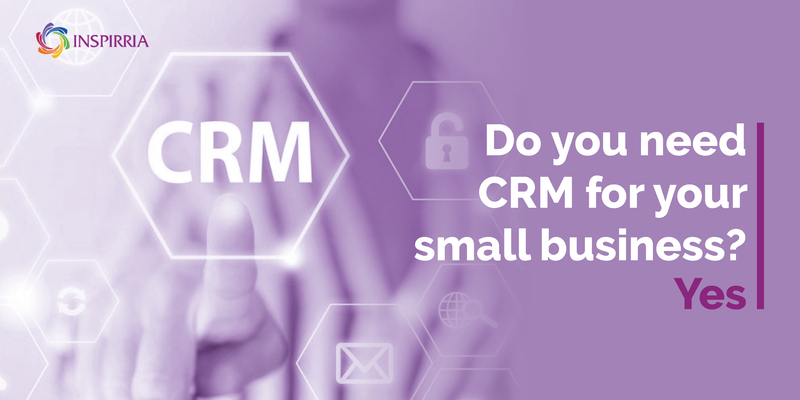 Do you need CRM for your small business? Yes ! And Let’s see why? The notion of CRM has always been ‘for a large enterprise’. But surprisingly, small and medium companies have realized that having a technology like CRM supports growth and that is vital when you are new and nascent. CRM was conceived primarily to maintain relationships with customers and drive loyalty. And isn’t a growing organization the best candidate for that? If there was no CRM system in place, companies would have to rely on spreadsheets, docs, emails and even business cards. That would make customer relationship management manual, tedious and error-prone. Moreover, this is definitely not scalable when a business has grown. Most of the communication in such cases would rely on employees’ email inboxes and run the risk of negligence and dependency. Having one platform that ties together all customer data ]that maybe lying in excel, access or accounting systems] makes it much more organized and efficient. So, starting a business with a CRM system makes a lot of sense. But if you didn’t, it’s not late, jump on the CRM wagon now. When choosing the CRM technology, think ahead about where you want to be a year from now. First step, choose a platform which is affordable. As a next parameter, check for a solution that is easy to implement and does not make you too dependent on an IT team. After usability, evaluate automation features, mobile-friendliness, third-party integrations, reporting and analytics, and security. You should also do a review of the customer support and see if the company will be on call to resolve issues. Stay wary of bloatware (excessive feature list), which is common for CRM software. Look for core CRM functionality and how it will serve you. Treat the CRM system like a map for your small business. It should help you understand where you are with your customers, what direction you need to take to keep them satisfied, and the challenges you need to overcome to close the deals with them. The CRM system will let you collate and analyse the data so you can continually improve and modify efforts towards effectiveness. Being active on social media does not cost much at all and with the help of a CRM system you will be able to brand yourself in context of your customers and against a calendar. Research shows that in some industries more than 50% of consumers want more personalised goods and services, and they are willing to pay a 20% premium for this personalisation. A CRM system enables this as it lets you communicate with potential customers based on previous interactions, purchases or demographics. With CRM, you will be able to actually track where all the investments into sales and marketing are going and what needs to be tweaked to yield more ROI. According to research, businesses using CRM software have 28% higher revenue than those using spreadsheets, paper based records or not having a system for recording or analysing customer interactions - Being digital being the key enabler here. Take a look at Salesforce’s new release - Sales Cloud Essentials. This is great if you are new to CRM or small in terms of size. A setup assistant makes the product intuitive and easy to customize. Companies can create a personalised platform by incorporating different aspects to suit needs. Nothing should potentially stop you now. If you are deliberating over whether a CRM expense will be worth it, dispense that thought and go ahead. Proof - 94% of businesses that have upgraded to CRM software report a definite and vast improvement from their previous system. Inspirria is a leading cloud aggregator offering cloud services and support to cater to the dynamic growth requirements of organizations. With more than 14 years of experience in cloud technologies and over 500 clients around the world, we have helped businesses maximize efficiency and visibility for rapid and agile growth.